pick up at your hotel in Hanoi for the overnight train to Lao Cai. Afternoon, freely descover Sapa town. Overnight in Sapa. The first day of trikking Sapa tour ends. 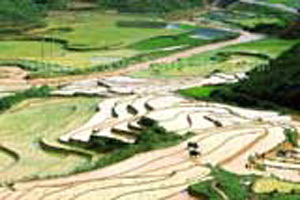 8:30 Begin your trekking Sapa tour through the paths cross rice terrace fields to Y Linh Ho vilage. Trek though hillsides along MuongHoa river. Cross the river by a suspension bridge to reach Lao Chai village where you can see small cottages in beautiful nature. Enjoy picnic lunch prepared by your guide. Afternoon, continue your trekking Sapa tour to Ta Van village, home to Dzay and red Dzao minority groups. Take the paths across the paddy fields, see and chat with minority people working on the fields. Discover their villages. Have breakfast. 9:00 your Sapa trekking tour begins by trekking through the paths of bamboo forest to Giang Ta Chai village where the H Mong and Red Dzao live. Car pick up and drive to Ban Ho village where the Tay ethnic group live. Have lunch. Trek to the water fall. Discover the village. Enjoy dinner. Overnight in Tay family. the third day of trekking Sapa tour ends. Free to discover Sapa town. Afternoon, enjoy ease trekking Sapa tour to Ta Phin village of The red Dzao and black H's Mong people. The village is on the slops of beautiful mountain. Drive back to Lao Cai. Have dinner. Take the night train back to Hanoi. The fourth day of trekking Sapa package ends. When the train get back, you will be picked up and transfered to your hotel. Now, your trekking Sapa package ends. Note:Sapa tours' itinerary is subject to change without prior notice.